QueBIT Blog: Cognos Analytics – It’s a Brave New World! The official release of IBM Cognos Analytics (aka Cognos 11) represents a major re-write of the Cognos business analytics tools (not to mention, a re-branding of a re-brand). I’ve recently attended a Cognos Analytics training session and spent some time working in a Cognos Analytics environment. Upon first impression, first look, first use, the delta between 10.2.2 and Cognos Analytics is more substantial than the delta between 10.1 and 10.2, which was a major re-write in 2011. With the release of 10.2, functionality was added, improved, expanded, (and re-branded), but things felt and worked somewhat the same in 10.1 vs. 10.2 (please don’t email me with every instance where this is not true). Cognos Analytics feels like a much more modern, accessible; dare I say more elegant design. One gets the sense that much of the slick design aesthetics found in things like Watson Analytics and the RAVE/visualizations are being applied universally, cohesively, to more and more products. This leads to the sense of unifying and consolidating the IBM analytics experience. 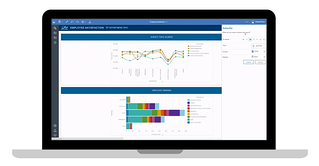 My initial impression is that users coming to Cognos Analytics for the first time will have a smooth, enjoyable experience curating, creating, and consuming content. The new environment fosters a sense of user empowerment through simplicity. For those who have spent time working in previous releases, there will be a minimal adjustment period. I suspect after the initial situational awareness is achieved (e.g. where’s that thing, or how do I do this task now? ), the old way will quickly feel old and dated. The changes are apparent as soon as you log into a Cognos Analytics environment. No longer are you presented with Cognos Connection, which while a great tool itself, with good functionality, feels a bit clunky or hulking at times (to me anyway). It feels very much like a traditional asset management system (read, more about the asset management, less about user experience). In Cognos Analytics the edifice of the system is minimized. Content seems much more readily accessible. And while most functionality remains, it’s blended into the environment with a minimization of icons and menus. Certainly from a report development and dashboard creation perspective, the experience today is much different. Think consolidation. Tools, resources, assets, etc., that were parsed out by their specific tools in previous versions, all now live together in a single integrated development space. You can easily slip between ad hoc dashboard development (think Workspace, which does remain, with somewhat diminished functionality or more complex report development (think Report Studio). The two main report development tools in 10.2 and 10.1 (e.g. Report Studio and Workspace Advanced) are no longer branded, stand-alone tools. Their core functionality is now baked into Cognos Analytics’ integrated development environment. As a footnote, and perhaps a bit surprising, Analysis Studio and Query Studio, which seemed destined for pasture, remain as a relic of days gone by (they just look and feel dated from a UI/UX perspective). Event Studio and Workspace also come along into the new world. If you find yourself nostalgic for previous times (e.g. a previous release), it is possible to run Cognos Analytics in “Legacy Mode”, which will enable all the tools/functionality found in 10 (including Analysis Studio & Query Studio, Workspace, Event Studio, Metric Studio, and PowerPlay. By default, the Legacy Mode switch is turned off for all new customers. Another big shift in the new release is the data module functionality, which is aimed at putting some "light-weight" modeling functionality in the hands of the business users (rest assured Framework Manage remains). Similar in some regards to the "External Data" functionality found in 10.2.x, which whenever mentioned to clients would get wide-eyed excitement from the business user, while the data stewards/admins grimaced at the thought of a free-for-all with everyone importing their "special" data. In Cognos Analytics, there definitely seems to be an embracing (by IBM anyway) of the experience of bringing together enterprise and "other" data. It will be interesting to see where/how the rubber hits the road on this one. All of these changes are geared towards making Cognos Analytics a smarter, less imposing presence for the end user, while being more supportive and intuitive. So off we go with Cognos Analytics, a different world for sure, a brave new world! In forthcoming posts, we'll take a deeper look at some of these new features/functionality and what it means in a practical application.